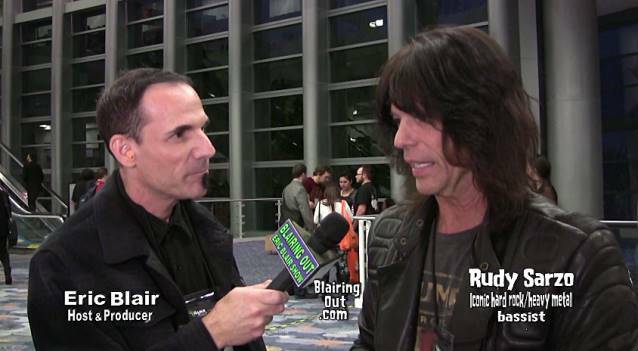 Eric Blair of "The Blairing Out With Eric Blair Show" conducted an interview with legendary bassist Rudy Sarzo (Geoff Tate's QUEENSRŸCHE, OZZY OSBOURNE, QUIET RIOT, WHITESNAKE, DIO, ANIMETAL USA) at this year's NAMM (National Association Of Music Merchants) show, which took place January 23-26 at the Anaheim Convention Center in Anaheim, California. You can now watch the chat below. Asked what it is like to perform with Geoff Tate's version of QUEENSRŸCHE, Sarzo said: "Geoff Tate is, to me, of his generation the finest composer, singer, frontman that ever was, of that generation. [He is] a joy to work with, to be in the band, to be in his company, to hear his voice on stage… off stage [as well], because he sings a lot off stage too. And he's got a wonderful band, including my brother [Robert] is in it. And also members of the QUEENSRŸCHE family that have been around for a long time, like Kelly Gray, Randy Gane… all those guys. And also I get to play with my old DIO rhythm section bandmate Simon Wright, so it's a very joyful occasion… It's a family. Absolutely. Otherwise, after a year, we wouldn't [still] be doing this. [Laughs]"
Regarding whether Tate includes him in the songwriting process, Sarzo said: "You know, what happened was, even before we went out on tour, Geoff needed to come out with a record to make a statement. So I played on three tracks [on the 'Frequency Unknown' album], [but] I was not part of the [songwriting] process [because] we weren't a band yet. So hopefully in the future, we'll be part of the [songwriting] process too." Tate's QUEENSRŸCHE now features Tate along with guitarist Kelly Gray (QUEENSRŸCHE 1998-2001), keyboardist Randy Gane and the band's latest additions, guitarist Robert Sarzo (QUIET RIOT, HURRICANE), Rudy Sarzo and drummer Simon Wright (AC/DC, DIO, RHINO BUCKET). 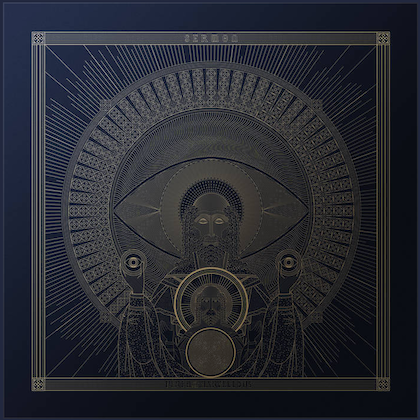 "Frequency Unknown", the latest album from the Geoff Tate-fronted version of QUEENSRŸCHE, sold around 5,500 copies in its first week of release in the United States to land at position No. 82 on The Billboard 200 chart. Issued on April 23, 2013, the CD was produced by Jason Slater at a studio in Northern California.